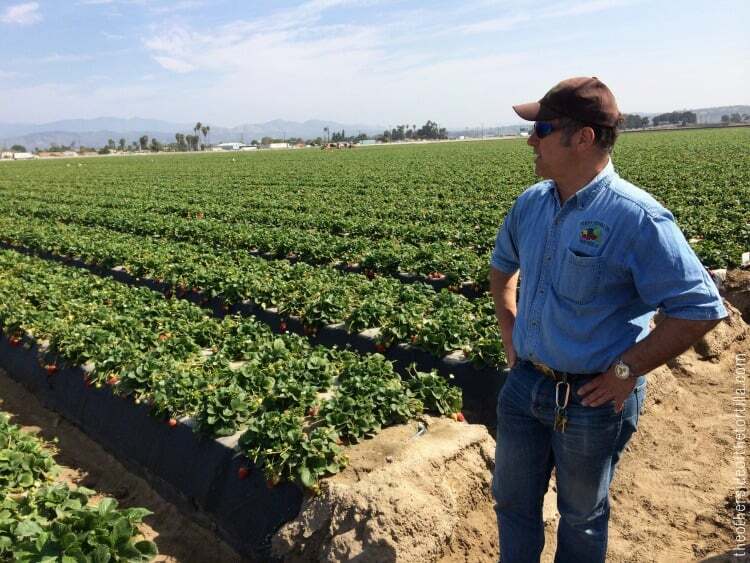 In March, I was invited by the California Strawberry Commission to tour a strawberry farm. This invitation came about after I recently passed through Oxnard on a road trip, where there happen to be several of strawberry farms, and I shared a photo on Instagram and Twitter, asking whether there were any farms that gave tours. 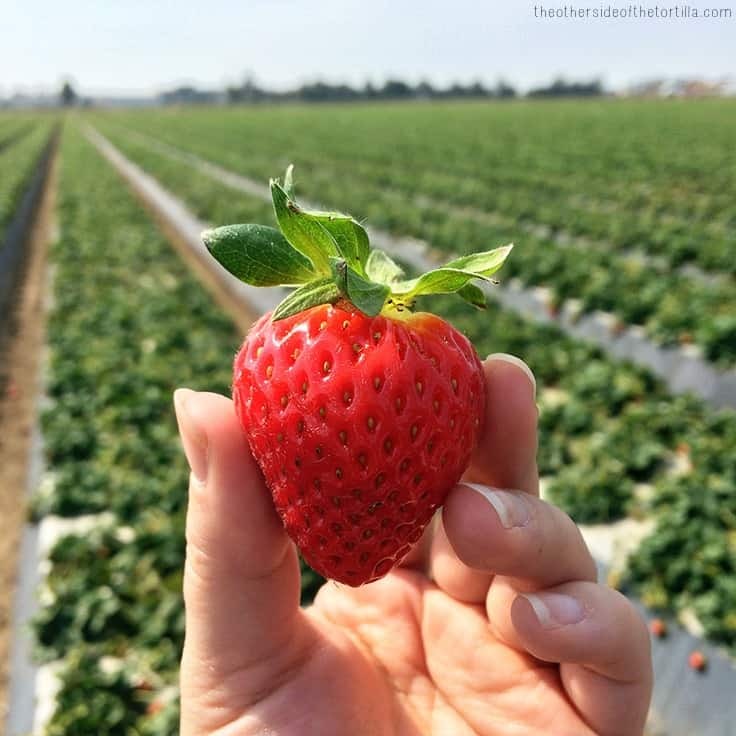 The fields and roadside strawberry stands in Oxnard reminded me of Irapuato, a central Mexican town best known for its strawberry fields and the quaint roadside stands where you can get fresh fresas con crema. I’m always interested in knowing about where my food comes from, and living in California, there’s an abundance of local, fresh produce year-round. I was excited to visit a California strawberry farm and have the chance to ask the farmers questions about where my berries come from and how they’re grown. This post is sponsored by the California Strawberry Commission, but all experiences and opinions are my own. On this visit, I learned that nearly 90 percent of strawberries grown in the U.S. come from California, and strawberries are grown here year-round (with a peak season in March and April) due to the optimal climate, sandy coastal soil and ocean exposure. There are more than 400 strawberry farmers who grow both conventional and organic berries, and California is also the biggest grower of organic strawberries worldwide. Oxnard, where the farm we visited is located, is about 60 miles from downtown Los Angeles. The farm that we visited was a family farm that has been farming in Ventura County, California, for more than 110 years. Farmers Edgar and William Terry gave us a tour of their farm, a chance to taste berries fresh from the field and ask questions—even the hard ones. Although the farm we visited was not an organic strawberry farm, I learned a great deal about the methods for growing strawberries and food safety issues (both food safety practiced in the field by the people picking your berries as well as pesticides used and how they affect our health), as well as who is growing and picking my strawberries. Farmer Edgar Terry of Terry Farms (pictured below) talked to us about the challenges of strawberry farming. Here are some of the questions I asked during the strawberry farm visit, and the answers I received from both the farmers and the California Strawberry Commission. There are no genetically modified strawberries commercially grown or sold. Although there are different varieties of strawberries that thrive in different conditions, all varieties grown are developed through traditional plant breeding methods by selecting two plants and crossing them using their flowers. Should I worry about pesticides? Should I only eat organic strawberries? As I learned on the farm, the last person to touch your berries before you open the box after purchasing them in the store is the person who picked them. Because of this fact, there is a lot of attention paid to properly educating farm workers on hygiene and food safety. Whether you choose to eat organic strawberries over the conventionally grown kind is really up to you. The EPA’s testing requirements for pesticides used on food are more extensive than any other chemical class, and the government agency’s testing includes risk assessment for unborn babies, infants and children. Aside from conventional and organic growing methods in soil, are there any other ways strawberries are grown? During my farm visit, I learned about a really interesting method of growing that involves planting the strawberries in a substrate (at Terry Farms, they use a mixture of coconut shavings and peat moss) instead of soil. This cuts down the amount of pesticides needed due to soil-borne issues. This method is not new, but is typically used in greenhouse growing rather than outdoors. It is not organic, but it is one step toward organic from conventional growing. It is more expensive to grow strawberries this way, and commercially grown strawberries that come from substrate rather than soil are not currently labeled in a way that the consumer could tell if the strawberries were grown using that farming method. How do I know if strawberries I’m buying are organic? What should I ask vendors at the farmers market to determine if my berries are organic? According to farmer Edgar Terry, not all farmers markets strictly regulate where the produce being sold is coming from. However, there are a few questions you can ask farmers market vendors to figure it out so you’re actually getting what you’re paying for. The people selling you produce in a farmers market should be knowledgeable about where their berries (or any other produce) come from. 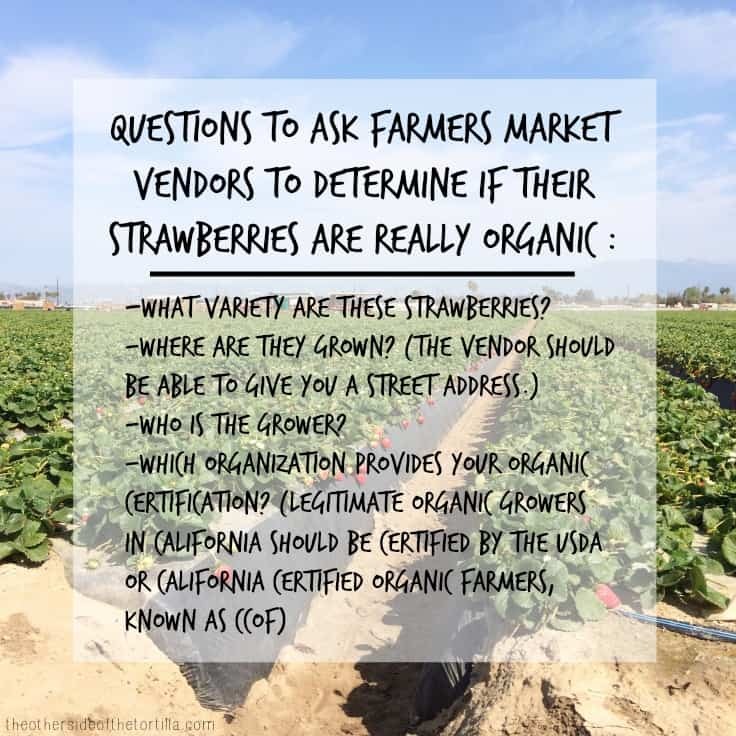 If berries are being sold as organic strawberries, you should ask which organization provided the organic certification and where you can see a copy of the certification. Any legitimate organic grower should be certified by the USDA or the California Certified Organic Farmers organization (also known as CCOF). Other questions you should ask farmers market vendors selling organic strawberries include: What variety are these strawberries? Where are they grown? Who is the grower? The vendor should be able to answer all of your questions. Here’s a handy infographic I made that you can pin on Pinterest to remember the questions next time you’re at the farmers market. Who is growing and who is picking my strawberries in California? What kind of life do the field workers have? 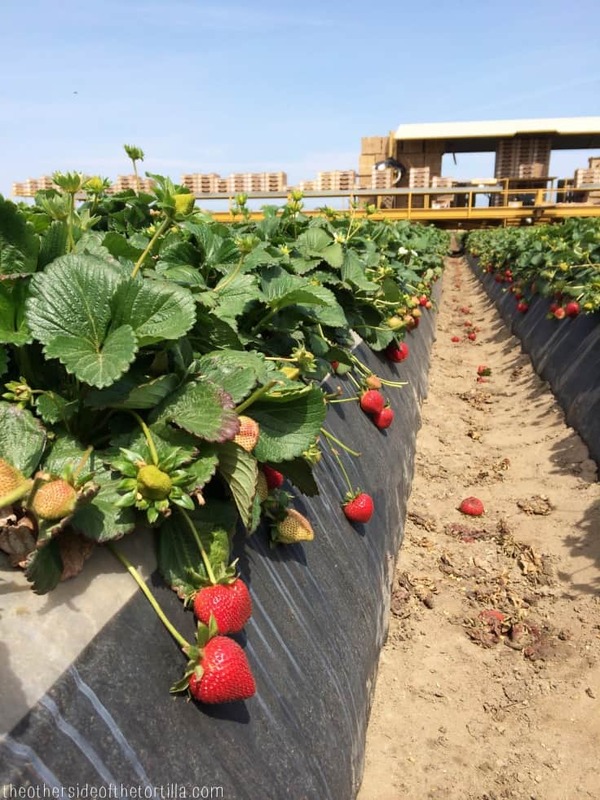 About 65 percent of strawberry growers in California are Hispanic, and most of those are Mexican-American. Most of the field workers are also Mexican or Mexican-American. The field workers have access to healthcare, mostly under the Affordable Care Act. Most of the field workers live locally, near the farms. An average field worker can earn about $30,000 a year; those who are most efficient can earn $40,000 a year or more, depending on the farm and the crop, whether they travel to pick the most lucrative crops, and whether they work more than five days per week. Field workers don’t have a 9-5 kind of job, but they do get regular breaks, including for lunch, and there are laws about how close a bathroom facility needs to be to the area where they are picking crops. The farmers acknowledged that there is currently a shortage of available field workers and that they believed some changes to the U.S. immigration system could potentially help solve this problem. Grilled chicken tacos with savory strawberry, serrano chile, fire-roasted corn, red onion and avocado salsa with queso añejo. 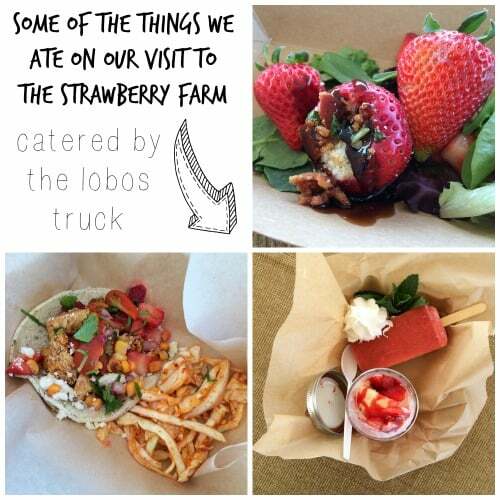 Want to check out some of our recipes with strawberries on The Other Side of The Tortilla? We suggest agua fresca de fresa y mango or atole de fresa. What would you like to know about visiting a strawberry farm? What a great overview of the experience! Great questions, too! Thanks so much for coming out! How interesting and how fun. We don’t have a strawberry farm but we do have a strawberry patch and are getting many strawberries right now. I freeze the excess. Great post.